At the beginning of the last century, Romanian peasants discovered the solemn music of the military bands when they went into the cities. They were so impressed by these that they wanted to have brass bands in their villages as well. With the arrival of the communists, these popular country marching brass bands were invited to participate at official events. The regime confiscated their land, built immense industrial complexes and many of the farm-workers became factory workers. 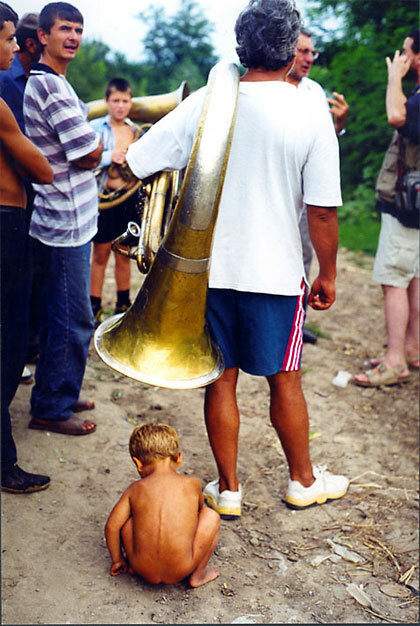 The brass bands then became a symbol of the people’s well-being and the brotherhood between the farm and factory workers. With the fall of the Communist regime, many factories closed down. The unemployed went back home to their country villages to take back their confiscated lands. And this music, played in the marriages, baptisms, the funerals, is one of the only things which stays in them: it is their pride. This unique mixture of Romanian tradition, military music, Austrian brass band and oriental rhythms (Turkish, gypsy), survives particularly in this region, border between Asia and Europe, that is Moldavia. A music just like its population, full of life, printed by nostalgia and so plural. Corneliu Georghita was born in Romania in 1958 and produced his first amateur films in 1976. He has since been working on various kinds of films film-projects and built his own film studio. He currently lives in France, where he emigrated to in 1990. Over the last decade, he has been working at the production of several films in Romania, both fictional and documentary. He also works as a teacher of cinema classes.